Share the post "Learning from Management Masters Over the Millennia"
I asked Morgen what his thoughts were as he was researching and writing his latest work…what were the timeless insights and long-lived wisdom that he learned and that I could share you with, dear reader. 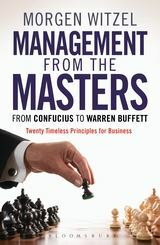 “Management from the Masters is a distillation of timeless principles that govern business today. These principles are gleaned from the ‘masters’, those wise individuals whose ideas remain as relevant today as ever – and will continue to be relevant through all our tomorrows. “Some of the masters are respected business gurus. W. Edwards Deming, the master of quality, knew that quality is not just a bolt-on, it is one of the fundamental purposes of business. Peter Drucker, who defined ‘management’ more closely than anyone before or sense, reminds us that without customers, no business can survive. Andrew Grove’s rule, that ‘only the paranoid survive’, stands as a salutary reminder against overconfidence. Henri Fayol’s insistence that management is about coordination of the parts to achieve a greater end remains at the heart of purposive management, and Joseph Juran’s 80-20 rule, or ‘Pareto’s Law’ which shows how 80 per cent of value is created by 20 per cent of people is proven right over and over again. “Some come from broader spheres. The physicists who developed the concept of ‘time’s arrow’ and the law of entropy tell us that the status quo is impossible to maintain, that everything changes, while Charles Darwin and his colleagues remind us that in business as in life, those who survive are those most capable of evolution. Confucius’s golden rule, that we should treat others as we wish to be treated ourselves, reminds us of why justice and fairness are so important in business, and the ancient Indian sage Kautilya shows us how management is in fact a duty, not just a set of tasks to be performed. Share the post "Welcome – I Invite You to “Stay Tuned” To My Blog"
It’s an apt description for what I do – as a researcher, trend-detector and trendwatcher, I “tune in” to things going on that could have consequences near- or longer-term. Or, I tune in to “yesteryear,” to look at events and actions of the past for meaning in today’s world. As historian-philosopher George Santayana (1863-1952) observed a century ago in “Life of Reason,” those who cannot remember the past are condemned to repeat it. I do a lot of writing on the present and past and often in looking into the future. (No, not making any crystal ball claims.) This blog (an on-line log or “old-fashioned” journal) looks at things going on in our society that present signals worth detecting, dots worth connecting, boxes to think outside of…and so on. These are my personal views, not representative of anything more than my own thinking and writing (which helps me in my thinking). Case in point on thinking backward and forward and connecting dots: In October 1929, investors large and small in the the U.S. stock market suffered cataclysmic losses — too much speculation and junk on sale. Hundreds of banks failed. The “Great Depression” pushed millions of families from new middle class prosperity to poverty. In response, the Congress passed the “Banking Act of 1933,” which prohibited commercial banks from being connected to brokerage firms — this was “Glass-Steagall,” named for sponsors Senator Carter Glass and Representative Henry Steagall. (Both Democrats in a Democratically-controlled Congress with a new Democrat in the White House – President Franklin Roosevelt.) The measure was supposed to deter speculation — and was under attack from then on by bankers and “free market” advocates. The debate about Glass-Steagall protections going away and being a factor in the crisis a decade later is highly debated, pro and con, and in the end the matter is not so simple. Anyway, we can connect the dots…we now have “G-S Lite,” in the form of the Volcker Rule, named for former Federal Reserve Chairman Paul Volcker, who in 1979 helped to end ruinous inflation with his tough and courageous actions. Let’s see how things work out with this “lite” rule in place. The rule is part of the package of the Frank Wall Street Reform and Consumer Protection Act of 2008. (Sponsors were Senator Chris Dodd and Representative Barney Frank. Both Democrats. Both gone from Congress.) Is there a pattern here? Dunno – yet! What’s ahead for G-S Lite? Dunno – yet! As for predicting the future — of course, that was easy — the American Banking Association has now filed suit to challenges the legality of the Volcker Rule. Is this 1933…1986…1998…2008? Doesn’t matter — some of the challenges posed are consistent. Do Stay Tuned to our banking system! And calls for more regulation and less regulation and oversight. So that’s an example of tuning in to yesteryear and today and peering into the future as events unfold. Your feedback on my commentaries and ramblings are welcome. Thank you for tuning in today — I will try not to disappoint.